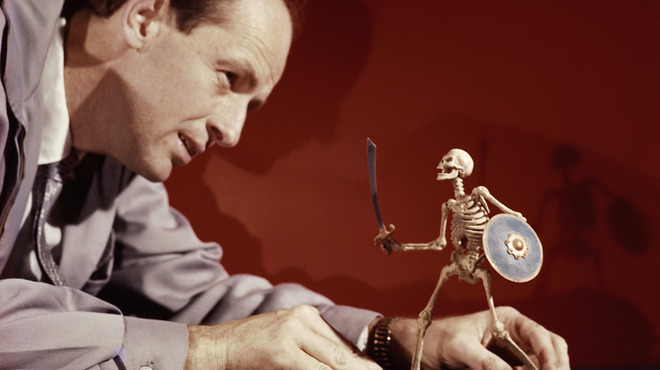 Special effects wizard and stop-motion model animator Ray Harryhausen died today at the age of 92. He created some of film's most iconic images in such films as The 7th Voyage of Sinbad and Jason and the Argonauts. Ray Harryhausen was born on 29 June 1920 in Los Angeles, California. His parents regularly took him to the cinema and he was only five years old when they took him to see The Lost World (1925). Based on the novel of the same name by Arthur Conan Doyle, the film made an impression on young Mr. Harryhausen, who was fascinated by its dinosaurs. It was the first time he was exposed to the work of pioneer stop motion animator Willis H. O'Brien. In 1933, at thirteen years of age, he went to see King Kong, featuring even more revolutionary stop motion animation from Willis H. O'Brien. If anything, King Kong made an even bigger impression on Ray Harryhusen. He asked his parents numerous questions about the film and when they could not answer them, he did his own research. It was not long before he was making his own marionettes based on the creatures in King Kong, including a a tyrannosaurus rex, a stegosaurus, an apatosaurus, a pterodactyl, and, first of all them, Kong himself. Eventually he learned about stop motion animation, and it was not long before he started making his own stop motion animation films with a borrowed 16mm camera. While he was still in high school Ray Harryhausen took night classes in art and anatomy at Los Angeles City College. He also took night classes in art direction, editing, and photography at the University of Southern California. It was during this period that Ray Harryhausen made friends with another teenager with a love of fantasy, Forrest Ackerman, who would go onto publish the magazine Famous Monsters of Filmland. It was Mr. Ackerman who encouraged Ray Harryhausen to join the Los Angeles Science Fiction League. It was in the Los Angeles Science Fiction League that he met Ray Bradbury, who not only became Mr. Harryhausen's lifelong friend, but also one of the most legendary writers of the 20th Century. At only age 18 he embarked on a project called Evolution of the World, which would trace the development of animals from the days of the dinosaurs to the emergence of mammals. He abandoned the project when he saw Disney's Fantasia with its "Rite of Spring" sequence, which depicted the beginning of the Earth (including the rise and demise of the dinosaurs). It was while he was working on Evolution of the World that he met Willis O'Brien. He called Mr. O'Brien at MGM and was able to visit the legendary stop motion animator. While Ray Harryhausen abandoned Evolution of the World, its footage did come in use. He was able to use the footage to get a job with producer and director George Pal working on Mr. Pal's series of stop motion shorts known as "Puppetoons," which were distributed by Paramount. He was paid $16 a week. He worked with George Pal from 1940 to 1942. With the onset of World War II, he enlisted in the United States Army. He was assigned to the Signal Corps and then became part of the Special Services Division. He worked on the "Why We Fight" series of documentary films overseen by Colonel Frank Capra. While Mr. Harryhausen was in the service, Major Ted Geisel (better known to the world as Dr. Seuss) also asked Mr. Harryhausen to make a sculpture of Private Snafu that would serve as a guide for animators when making the "Snafu" series of instructional animated shorts. After World War II he made a series of stop motion animated shorts based on nursery rhymes under the heading Mother Goose Stories. To make a living he did work for industrial films and television commercials. It was not long after he had completed Mother Goose Stories that he was contacted by Willis H. O'Brien to help with the stop motion animation on Merian C. Cooper's new feature film, Mighty Joe Young (1949). In the end Mr. Harryhausen would do around 90% of the stop motion animation on the film, including the famous sequence in which Joe engages in a tug of war with eight men. It was in late 1951 that Ray Harryhausen was given the chance to animate his first feature film. Initially titled The Monster From Under the Sea, it was released under the title The Beast from 20,000 Fathoms (1953). Significantly, it was based on a short story by Mr. Harryhausen's close friend, Ray Bradbury. Although it would not have a name yet, it was the first film on which Ray Harryhausen used the stop motion animation technique that would eventually be called "Dynamation." The Beast From 20,000 Fathoms would prove enormously successful, not only leading to the 1952 re-release of King Kong, but also allegedly leading Japanese producer Tomoyuki Tanaka to go ahead with the film Gojira (released in an edited form in the United States as Godzilla). Among the many who saw The Beast From 20,000 Fathoms was young Columbia Pictures producer Charles H. Schneer. Mr. Schneer had an idea for a film about a giant octopus on the loose in San Francisco, California and decided that Ray Harryhausen could handle the special effects on the picture. He got in contact with Mr. Harryhausen through a mutual friend. Although initially reluctant to make another monster movie, Mr. Harryhausen eventually agreed to work on Charles H. Schneer's film, which would be titled It Came from Beneath the Sea (1955). Following It Came from Beneath the Sea Ray Harryhausen worked on Irwin Allen's documentary The Animal World, animating dinosaurs and working with Willis H. O'Brien for one last time. After The Animal World Ray Harryhausen returned to Charles H. Schneer. Messrs. Harryhausen and Schneer made two more films, Earth vs. the Flying Saucers (1956) and 20 Million Miles to Earth (1957), before they made one of their most famous films. It was Ray Harryhausen who struck upon the idea of basing a film on the "Sinbad" tales in One Thousand and One Nights. Ray Harryhausen's outline for the film was titled Sinbad the Sailor; in the end it was titled The 7th Voyage of Sinbad. The 7th Voyage of Sinbad was Ray Harryhausen's first feature film shot in colour. It would also be the first film on which the term "Dynamation" was used, the term having been coined by Charles H. Schneer for use in promoting the film. The film featured some of Mr. Harryhausen's best known sequences, including a fight with a Cyclops and a skeleton fight on a spiral staircase. The 7th Voyage of Sinbad would prove to be one of Ray Harryhausen's most successful films, inspiring imitators well into the Sixties. Ray Harryhausen would then work on a loose adaptation of Jonathan Swift's Gulliver's Travels entitled The 3 Worlds of Gulliver (1959) and an adaptation of Jules Verne's The Mysterious Island (1960). Mr. Harryhausen's next film could well be his most famous, Jason and the Argonauts (1963). As early as the Fifties Ray Harryhausen had toyed with the idea of a film based on Greek mythology. It was while he was working on The Mysterious Island that he began to develop Jason and the Argonauts. Jason and the Argonauts would feature some of Mr. Harryhausen's most famous creations: the giant man of bronze Talos, the seven headed hydra, and, perhaps his most famous sequence of all time, Jason's fight with the Children of the Hydra (skeletal warriors). Amazingly enough, Jason and the Argonauts failed at the box office, although it has since gone on to become regarded as Ray Harryhausen's best film. Sadly, Ray Harryhausen's next film, an adaptation of H. G. Wells' First Men in the Moon (1964), would also fail at the box office. Ray Harryhausen's next project would not be with Charles M. Schneer. Instead he was hired by Hammer Films to provide the stop motion animation for One Million Years B.C. (1966). The film proved successful and launched Raquel Welch as a star. Ray Harryhausen's next film actually had its origins with Willis O'Brien. Willis O'Brien had conceived a scenario (originally entitled Valley of the Mists and later The Valley Where Time Stood Still), in which cowboys find an allosaurus in the Grand Canyon. Pre-production on the film had actually begun in 1941, but it was later abandoned. Willis O'Brien's scenario would finally be realised as Valley of the Gwangi, in which not only an allosaurus appears, but also a pteranodon, an ornithomimus, and a styracosaurus. While Valley of the Gwangi was not successful in its initial release, it would go onto become a cult film and would have an influence on movies ranging from Jurassic Park (1993) to Peter Jackson's remake of King Kong (2005). With the failure of Valley of the Gwangi at the box office, Ray Harryhausen and Charles M. Schneer decided to return to the sources of one of their most successful films, Sinbad and One Thousand and One Nights. Ray Harryhausen created an outline that would eventually become two films: The Golden Voyage of Sinbad (1974) and Sinbad and the Eye of the Tiger (1977). A highlight of The Golden Voyage of Sinbad was the sword battle with a six armed statue of the Hindu goddess Kali. The Golden Voyage of Sinbad did very well at the box office, so that Columbia decided to go ahead with Sinbad and the Eye of the Tiger even while The Golden Voyage of Sinbad was still in its initial release. Sinbad and the Eye of the Tiger would also perform well at the box office, despite lacklustre reviews. Sadly, Ray Harryhausen's next feature film would also be his last, Clash of the Titans (1981). The film featured one of his best sequences, that of Perseus and the gorgon Medusa. Clash of the Titans did relatively well at the box office. With its success another film based on mythology, Force of the Trojans (centred on Aeneas) was pitched to MGM in 1984, but never emerged. Ray Harryhausen then retired. Since then he has taken part in the British television documentary Working with Dinosaurs (2000) and also completed the last of his fairy tale shorts "The Story of 'The Tortoise & the Hare (2002)". He maintained lifelong friendships with Ray Bradbury, Forrest Ackerman, and Charles H. Schneer. Quite simply, Ray Harryhausen was the greatest stop motion animator of all time. He strove for realism in his stop motion animations and in doing so revolutionised the field. Dynmation, his technique of stop motion animation, allowed for stop motion animated models to be placed directly in the action so that they appeared to be interacting with the actors on the screen. This made Mr. Harryhausen's stop motion animation look far more realistic than anything that had come before it. What makes Ray Harryhausen all the more remarkable is that his stop motion animation still holds up today. In an age of nearly photo-realistic computer-generated imagery, Ray Harryhausen's films still look better than most of what is released today. Of course, while Ray Harryhausen was most often credited for "visual effects" or "animation" on his films, his participation in them went much further. More often than not it was Mr. Harryhausen who conceived the stories in his films, making an outline before any special effects work began. He also took part in choosing the locations for his films and even had a hand in their art direction. Arguably, Ray Harryhausen had more impact on the films he made than even the writers and directors. Quite simply, he was not simply a stop motion animator, he was an auteur. Throughout the years Ray Harryhausen's work would touch many lives, not the least of which was my own. The first film I can remember watching all the way through was Jason and the Argonauts when I was about four years old. The film had me transfixed. I particularly marvelled at Jason's battle with the skeletal Children of the Hydra. At that time Mr. Harryhausen's films were still shown frequently on local television stations, so I had a chance to see all of them, from The Beast from 20,000 Fathoms to Clash of the Titans. They fuelled in me an interest not only in mythology and folklore, but also in fantasy, an interest that would later expand to include horror and science fiction. Eventually I would write my own fantasies. Alongside the Sixties TV series Batman (which would lead me to comic books and then writing my own comic books), then, Ray Harryhausen may largely be responsible for my writing career. It is for that reason that today has been a particularly sad one for me, and this had been one of the most difficult eulogies I have had to write. Of course, I am far from the only person whose life was touched by Ray Harryhausen. Millions of others have been touched by his work. Film makers from Stephen Spielberg to Peter Jackson have been influenced by him. A lucky few have even been touched by the man himself. Perhaps because he had begun as a fan himself, Ray Harryhausen was always warm and friendly towards his fans. He was often a guest at conventions, where he was always congenial. I have never heard or read anything from anyone who described Ray Harryhausen as anything less than one of the kindest, most amiable gentlemen one could. Ray Harryhausen was then not only an innovative special effects wizard, master stop motion animator, and a cinematic genius, he was one of those rarest of men--a truly great gentleman. I loved his stuff, especially Mysterious Island. Really some of my best childhood movie memories.